Stand back. This is gonna get messy. I’m going to teach you how to make something without a recipe. Before you panic, remember that your grandmother made lots of things without recipes and without measuring everything down to the last 5/9ths of a teaspoon. Just breath. That’s right, it will be okay. It’s easy to make jam and you can do it without a recipe. Cheap Italian cake? Make it cheap Italian cupcakes and we’d both be into that! Will there be a jar left in October? David you are sooooooo funny (green whiskers….Mhahahahha). That’s how my mom makes her strawberry jam, no recipe, just eyeballing and go by the feeling. Come to think about it, may be it is the “no-recipe” cooking that give moms’ dishes such miracle appeal. Oh David, can’t you just be a good lad and make enough for all of us? You’re all welcome to come to Paris when Pim comes back in the fall..we’ll have a jam-fest. I’ll start inflating the Aerobed! 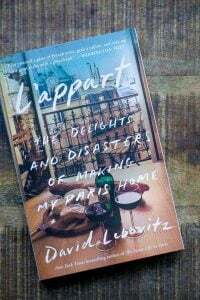 OR you could use some of it in the best home-made ice cream in Paris! Can’t wait for your next cookbook to come out…how long did you say we have to wait?? send me a jar of yours and I’ll send you a jar of mine…. Shuna & Sil: I’d send you some jam, but I’m still anxiously awaiting my last package that was shipped overseas, which I sent in April…. Ha, that’s hilarious. I’ll try this method. Can you substitute any fruit, or is there some magic pectin ratio? I used a similar method to make strawberry jam (from Christine Ferber’s book), and it never jelled even though I cooked it for way longer than directed. It was still tasty, if not super sweet. Ahhh, this was very funny – thanks! By the way, I have a spare guest room, anyone barring excellent jam, may stay. 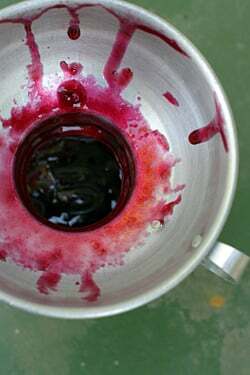 I have just finished making your jam, David, with the first abundant harvest our little sour cherry tree offered us. You should know, that three years ago we harvested 7(! )cherries, and I was laughing because I was hoping to make a cherry pie ! But not with seven cherries.. This year- after having eaten our fill-my husband ‘harvested’ the rest–and here is the result. Two and one half jars of the best, easiest cherry jam I ever had ! The flavor is bright, tart and sparkles on your tongue. I am ashamed to admit that I licked every cherry jam covered utensil clean, my every move followed by my three attentive standard poodles. But just because they might have hailed from France, is no reason why I should share my French cherry jam with them. Actually, I don’t want to share my jam with anyone ! As a matter of fact, next year I am going to hide the jam as soon as I make it, and pretend that we had a plague of locust who made off with every last cherry ! So glad your jam-making was a success and that you have plenty to go around. My address is ……. Glad you and your husband (and poodles) have a delicious reward from your tree. the boiling water bath phase right now. I found that the jam was still very thin and didn’t pass the sheeting-off-a-spoon or the frozen plate tests when it reached the proper jam temperature (211 or 212F at our elevation — water boils at 203F). At this point I panicked that the lemon juice & zest were not supplying enough pectin and added some grated apple (as my raspberry jam recipe calls for). The mixture didn’t pass the sheeting or plate tests until about 230F. The raspberry jam sheeted at 212F. Is this normal? Is there something about cherries that requires the higher temperature than raspberries? My other question is that your recipe does not warn against trying to process more than about 4 cups in one batch like most jam recipes do. Is this limitation really critical? Thanks again for the recipe. I had been searching all over for a commercial pectin-free cherry jam recipe. 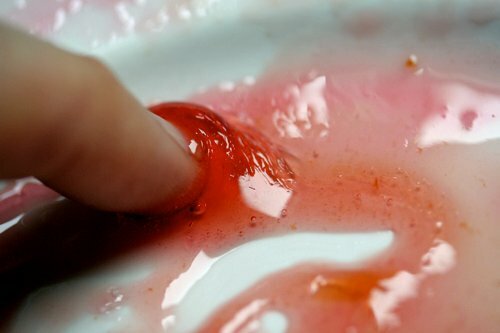 Hi Carol: Most jams do jell at 230 degrees, although I have always used the wrinkle-finger test and have never had a problem. I used 2 kilos of cherries, about 4 # for the recipe shown. I’m uncertain how many cups that is, but it is indeed preferable to make smaller, rather than larger, batches. Thank you for answering my questions. I guess I need to double-check my sources on jam making. I had about 8 cups of cherries after cooking them, so I divided it into two batches. The first batch, which prompted my question on August 8 was a little over-cooked. It is spreadable, but barely so. The flavor, however, is wonderful. For the second batch, which I made after your reply, I trusted your recipe and did not add any apple. It ended up being slightly under-gelled in my opinion, because I was afraid of over-cooking it, but still was a wonderful jam. Thank you for a wonderful recipe. I’m sure that the more I make this recipe, the more confident I will become in diagnosing the jam without a thermometer. We live in in Mendocino county on the coast of California. We have just picked two very large baggies full of sour cherries and another of bing. I am about to make jam with them and will be using your recipe. 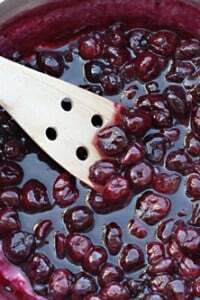 I have found that adding a few dried cranberries into my jams made from fruit with less pectin works very well and will do so this time just to be sure. We don’t live high up in the mountains but cook with propane. This will be my first time making jam on a propane stove which may cause me a bit of problem with getting the right consistency. I will follow your testing technique in hopes of getting it right. If you don’t have a scale to weigh the cherries how else might I calculate the correct quantity for the recipe? 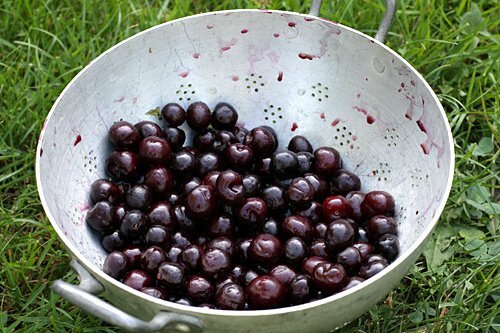 Hi Nancy: In the recipe, I mention that I use a measuring cup to measure the cooked cherries. So just whatever quantity of cherries you start with, use a measuring up to gauge how much you have once they’re cooked. Does this jam have to be stored in the fridge, or can it be sealed and stored on the shelf? Hi Kathy: Since it’s not canned, I store mine in the refrigerator, where I find it lasts at least 2-3 months, if not longer. Can this cherry jam recipe be canned, for longer storage? Do you know if you could use lime juice and zest in place of the lemon? I made this today and it’s amazing! It’s a little firm, but I figure I’ll know for next time. Can I make this with fruits other than cherries? Perhaps a little peach? Jules: Yes! I use the same basic proportions for most of my fruit-based jams. I’m about to make your jam with some large Lapin cherries. I don’t use sugar in my diet but substitute agave syrup. Any guidelines or suggestions? Sugar doesn’t agree with me but I tolerate agave just fine. Great recipe David, especially since my jam making is haphazard in the measurement department. Carol’s tip is right on about grating an apple for cherry jam to boost the pectin level. After a recent pitting (and pity) party where I was the only guest, I have a whole new appreciation for cherry jam. While labor-intensive, it’s worth every stained finger. cheers, Tom. I canned 4 pints of this jam using the “hot pack” method in early July and then stored the extra jars in a cool, dark cupboard. It’s been my experience with other jams, such as red raspberry, that they will darken in about 3-4 months if not used quickly but flavor is unaffected. For that reason, I make small batches of “fresh” jam about every 5 months storing the extra fruit I pick in season in the freezer. I noticed the 1 jar of cherry jam my younger daughter has not found hidden (and also has not gobbled shamelessly while I am at work) is now starting to turn as well. Thank you David, My 10 year and I decided to tackle the sour cherries sitting uneaten in the fridge using your no recipe – and our jam ROCKS! Made this amazing cherry jam today. Divine, I cooked it up with a vanilla pod and was so tempted to pop a hot cherry into my mouth but remembered the warning of hot cherries, so placed it in a plate to cool first. The next batch I’m going to add a little good quality port for a bit of extra liquid. Success! perfect wrinkle. I made a tiny, tiny batch, and mixed my handful of sour cherries with a couple of cups of rhubarb. It is awesome. I’m glad cherry season is right around the corner. I’m considering the cherry jam. Is it really necessary to pit the cherries? Wouldn’t they float up as plum pips do? I made this jam today and added a couple tablespoons of golden rum. Turned out so well. Thank you! I appreciate any recipe that tells me what to wear. Aiyah! You people make me soooooo envious! No cherry trees here.. and when we do get them… they cost an arm and a leg. I’ve never bought more than 1/2 a pound at a time. And I soooooooooo love them! Raspberries, too – but I’ve only seen frozen and canned ones. Some folks are just so lucky. I recently moved to Michigan (area) where there are lots of cherries. They are not quite ready yet, but this is what I’ll be doing with my bounty. But first I always make your Chocolate and Fresh Candied Cherry Cake and Toasted Almond and Candied Cherry Ice Cream whenever I get my hands on some cherries. I would walk through broken glass for your cherry and chocolate cake! I made yor recipe for Green Tea Madelines and dipped one side in white chocolate after glazing (I had extra melted white chocolate and couldn’t let it go to waste). They turned out great, I’ll definitely be making them again. Thanks! You rock! I love the style of your no-recipe; measuring by eye and feeling is how I prefer to cook. I make some interesting dishes that way! :) I think I added too much sugar to the jam, but it still tastes great so far and seems to be getting less sweet the longer I boil it. I’m doing my second wrinkly-test now. 2) In step 7, you say, “Once the bubbles subside . . .” The bubbles increase the longer I boil the jam; am I supposed to occasionally turn down the heat/move the pot to a cool burner to see if the jam’s gelling? The jam doesn’t look gel-ish to me, but it’s not pure liquid, either. My second test is done. Ohmigod. Ohmigod. This is WAY sweet, and doesn’t seem very thick, but it is SO FREAKING GOOD. I let it cook a bit long without stirring it last time (difficult siblings), so I think I may leave it at this, but this is fantastic. ^__^ We’ll see how it turns out after it’s been in the fridge. daphne: Yes, you should pit them first. They won’t pop out and float on their own, unfortunately! 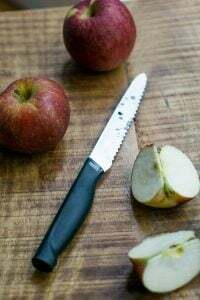 LarissaFae: Since this recipe can be tailored to make as much, or as little, jam as you want, use just enough water to get them juicing with the heat. Try about 1 cup (250ml). If you’re unsure of the temperature, use a candy thermometer-jam jells at about 220ºF. And yes, jam is sweet as the sugar is a preserving & jelling agent. My recipe uses less than normal but perhaps there are recipes out there that use less which you can give a go at. Lynette: I love port and cherries. Great idea! Well, I’m with Daphne. I bought a “cherry pitter”, haven’t used it yet but money is no object when it comes to jam. When we were in Turkey in 02 a hotel we were in had cherry jam that was the consistency of honey and they had left the pits in. Many were loose but many were “in” requiring very careful chewing on toast but Yes It Was Worth It! So on Sunday I get a flat of sour cherries from a local organic farm and will try to can them the way I do my marmalade. Will let you know. This was such genius I made it again with a berry blend. raspberries, blueberries, blackberries and strawberries. I still added lemon juice to help with the jelling even though I had higher acid fruit. Lovely. 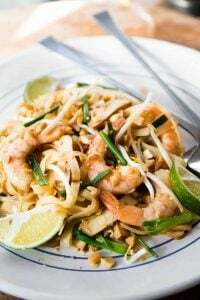 How do I print recipe recommended by kate city cook? i don’t want 9 pages if I just hit print. If you want to print a recipe, you can highlight the recipe, and cut and paste it into whatever program you use for documents (such as Word) and then print it out. Just made 5 small jars this morning. 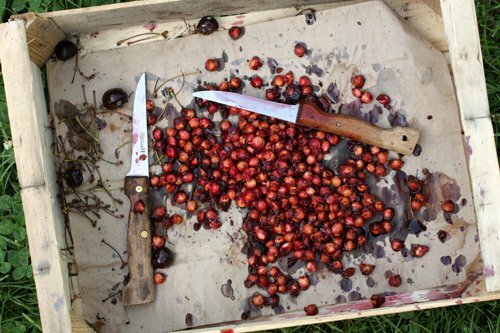 We used an antique cherry pitter….wonderful recipe…..We have several cherry trees, so other than pie – I can now make jam. Does the jam freeze well? We live in Akron Ohio and this is a really good year for our cherries. Looks like I’ve found the perfect recipe to use some of the sour cherries I’m planning to get at the Farmer’s Market tomorrow! Can I freeze this jam? Paula and Mary: I’ve never frozen jam, since it’s already a ‘preserve’, but if you try it, let us know how it works out. I love the way the post is written:). Makes it makable for people like me who would never venture to make jams. The recipe made me realise I had made something similar but did not know why I added the lemon. Thanks for the info. Well, I thought I was getting a “flat” of sour cherries but my son showed up with 30#! So I started in with a small batch to test. Used recommended amount of sugar but it was too sweet for my taste eventhough I was using sour variety. Cut the sugar by a third, a little tart but no complaints from the boss. Hot canned them and hope they keep. Finally finished with 6 medium batches of jam. This may be better than my Seville marmalade. The cherry pitter worked only so-so. It was fast but the sour variety is rather small and many cherries would by-pass the pitter shaft. Many pits would work free during the cooking process and could be fished out but I’m going to urge all to be careful. Try over vanilla ice cream! My favorite cherry pitter is a large hairpin, sometimes called a roller pin. Poke the rounded end into the cherry and the pit catches on it and pulls out easily. Just found this recipe and am very eager to try it. I have a huge cherry tree on a public path near my house and the cherries are ready to pick. The suggestion of adding port is great. 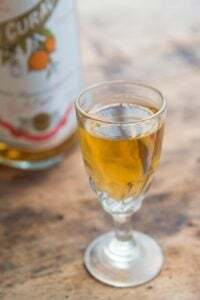 I was also wondering if amaretto would be a good addition or too overpowering? Perfect! Thank you so much for posting this! Our neighbors have several cherry trees, tart, and they always offer us cherries. I usually make pies or cobblers, but wanted to try jam this year and found your un-recipe recipe! My jam is cooling now and has just the right consistency. I just made this and it was very easy! I followed your steps and it worked wonderfully! My jam is cooling now and I can’t wait to try it! Thank you! I made this “no-recipe” recipe tonight. I guess since I’d never made jam before I needed more help knowing what to expect. My expectation of times was probably way off. I ended up boiling the sugar/cherry mixture 45 minutes waiting for it to thicken and reach 210 degrees. The jam never really passed the wrinkle test, bunching up as in the picture, even at 212 degrees. I feared caramalizing the sugar, as per your warning , so I pulled the plug, hoping for the best. Its cooling now. The flavor is fine, we’ll see in the morning about the jelling. I made this a couple of weeks ago and never got to post a comment…my jam never really “passed” the wrinkle test, but it jelled up beautifully. It did take much longer to thicken than I thought it would (also about 45 minutes). I didn’t have any lemons in the house, but tossed in a few dried cranberries. And I was confused about one poster’s question regarding how much water to add…I simply used the juice that was in with the cherries when I pitted them. Obviously the recipe’s forgiving enough, because it worked! 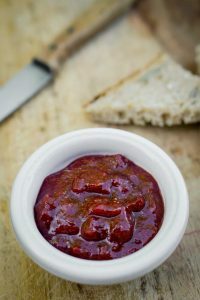 I’ve been passing this recipe on to everyone I know who has cherry trees…it’s the best cherry jam I’ve ever tasted! I made a half gallon of this jam in 4-cup batches.I still can’t believe I can grow sour cherries in Minnesota, but the crop from my dwarf Northstar was good this year. Owning too many cookbooks, I cross-checked the recipe with my old favorite Ann Seranne preserving book from 1971 and discovered the recipe is consistent with her jam chart re ratio of sugar/fruit/lemon juice. What puzzled me was cooking the cherries first without sugar. I couldn’t see any good reason for doing so, deciding that the cherries would be cooked faster and retain better color if cooked quickly with the sugar and lemon to the jellying point. So that’s what I did and can report it worked quite well. There’s always that nervous tension, standing there at the stove wondering if the jellying point has in fact been reached, squinting at the thermometer. But jam can be too thick as well, turning out leathery and sludgy. Soft jam is better. Finally I have given up on the thermometer and learned to trust the old spoon test one sees in old books. It really works. 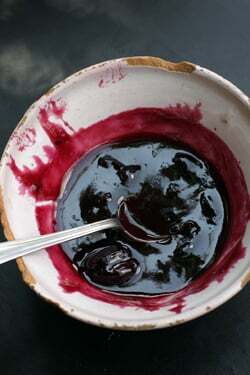 Dip your large metal cooking spoon into the jam as it cooks and let the jam run off. Watch how it drips off the spoon. For the longest time, there will be one point it drips from. When the jam is ready, it will drip off the spoon simultaneously from two different points. Then have the courage to stop cooking it. I canned mine in pint jars with a 20 minute boiling water bath, intending to use it as a topping for a daily dose of homemade yogurt. I made your cherry jam two years ago. It turned out just great-I really liked it. I just made it again, it did not thicken. I thought everything was ok, but this morning I noticed it was too runny. Can I remove it from the jars and re-cook it, trying to thicken it? Oh wow…this is so very good! Thank you so much! This is just the perfect recipe for our bounty of bing cherries. Thank you very much for this simple “no-recipe”. It is delicious and easy to make. I didn’t have a fresh lemon on hand but used a frozen cube of lemon juice I had saved from when I had juiced some whole organic lemons. (My cherries had reduced to 1 cup so I added 3/4 cup of sugar as you said.) Yummm! Ever since I was a little kid I’ve always loved cherry jam. I’ve never liked the commercially available ones so would always pick some up whenever I was at a farmer’s market, which is rare. A couple of years ago I found a brand from France that I fell in love with. It’s very expensive so I would have to ration out my addiction. Last night I made my own Cherry Jam for the first time using your (non)-recipe and it’s the best cherry jam I’ve ever had. Even better than the French import i’ve been buying. I absolutely love it. I used bing cherries like you suggested and it took on a deep blood red colour with a lot of gorgeous shine. I left most of the cherries whole because I like eating it warm over ice cream. Thank you, thank you, thank you for sharing this. I don’t think I will ever buy cherry jam again. I tried your recipe and despite cooking for ages I could not get it to set. I’ve just put it in jars and will see if anything happens when put in fridge. Any tips on what I could do better next time? Lou: As I mentioned above, the lemon juice helps the jam set because cherries are low in pectin. Lastly, some jams will just be more runnier than others. Fruits and berries will vary in sweetness and natural pectin. 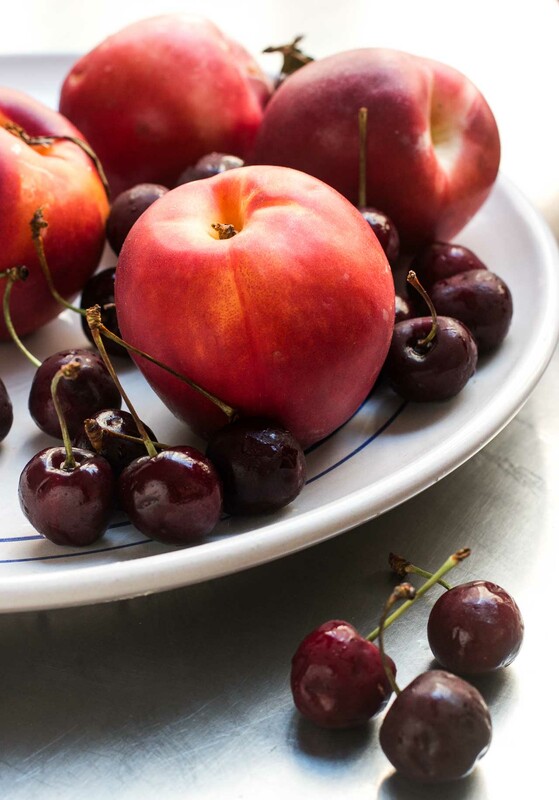 Ripe cherries have less pectin than less-ripe ones. David, Thank you so much for this concoction!! I planted two Montmorency cherry trees in our yard two years ago. This year we had our first sizable harvest. I baked my very first cherry pie ever and made my very first (successful… =) foray into jam making. I stayed up late last night to cook the cherries into jam because they were so beautiful and I couldn’t stand the thought of putting them in the fridge over night. My family woke up to toast and jam for breakfast; they are happy campers this morning. Thanks again for guiding me well into jam making! This is the second year we’ve looked after my parents’ house while they were away, and the cherries ripened! :) And, so this is the second year I’ve made your cherry jam, a great “non-recipe!” Taste is awesome, and I love the fact that there’s more fruit than sugar, unlike a lot of recipes. I too had a bit of trouble getting it to gel, it took quite a bit longer of watched boiling, but it’s thick now! Maybe the lemon seeds tip would help…Also, does freshly squeezed lemon juice work better than bottled? Thanks! great site, learnt loads, cheers! 1st experiment with Rowan Berry jam went OK, a bit too sweet still for me. Q. 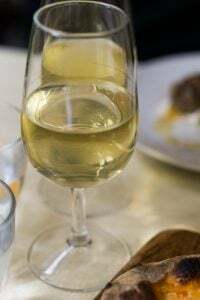 Can Lime juice / rind / pips be used in place of Lemons? Any pointers on Elderberry use? Kev: As mentioned above, lime juice can be used in place of lemon juice. 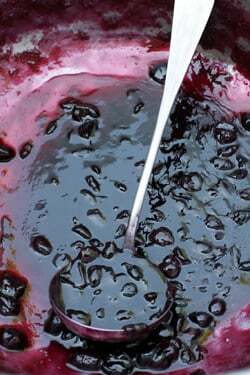 There’s a recipe for Elderberry Syrup of mine on the site. Julie: I’ve never used bottled lemon juice so can’t advise on that. 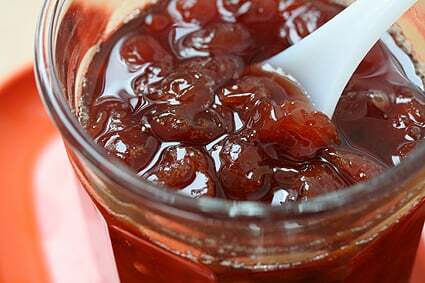 David, I used this recipe for cherry jam and I really liked it. Now I have a lot of blueberries on my hands that I’d like to preserve as well. Can the same formula apply? It was so quick and simple. Oh boy, I just made this and it didn’t turn out well, but I realized my mistake… I added the amount of sugar based on the pre-cooked cherry weight, so it pretty much turned to thick cherry sugar paste. I had to hurry and get it out of the pot before it (the pot) was ruined!! Oh well, pretty funny stuff except for the waste of my beautiful cherries. I’ll try again in the morning and will let you know. Hi, I am ashamed to say that I haven`t heard of you until tonight, when I was trawling the net looking for a recipe for jam. I apologise for ignorance and have to say that I enjoyed reading the recipe so much that I shall use it tomorrow! I love your writing style! My cherries are I think, of the amarelle type [ I picked them in July from my old dad`s tree] so will they be suitable for this recipe do you think? I have just defrosted them and pitted them all in readiness. Hopefully they will make a nice jam, not sure how much to make though, as there is only myself and dad to enjoy it; don`t want it to sprout green whiskers! It`s me again [see last comment]! Just to say that I made the jam today, used around 2lbs of cherries but did exactly what you said and measured the cooked fruit and juce, then added 3/4 the amount of sugar. Ab – so – lutely fan – tastic!!! Thankyou – going to use the other 4lbs of cherries to make more tomorrow! I’m so glad I found this. This is the first time I’ve seen one for cherries that used less sugar than cherries. I’ve seen recipes that call for only 3 pounds of cherries and 7 (yes SEVEN) cups of sugar. It made my mouth hurt thinking about it. One question that I do have, is if I’m making it with sour cherries do I still need the lemon juice and zest. others have told me no, just checking. Hi, I made cherry jam last week and it came out great. I used around 4 to 5 lbs of cherry’s to about 4 to 5 cups of sugar. I used lemon juice from the bottle and dried lemon peel. I cooked it for around an hour. It came out great. it didn’t gel the way the other batch did. I was scared to add more lemons and peel, because I thought it might over power the cherry taste. But this time it came out more like a cherry sauce instead of jam. Any help you can give would be great as its so much work, and I love homemade cherry jam. I just made a batch of this jam and it’s delicious! I didn’t have any kirsch or almond extract so I added a wee bit of amaretto instead and it tastes wonderful (then again, I like cheap italian cakes so…maybe I can’t be trusted?). I love coming here for recipes, thank you so much. Delicious reading and results. I also made your strawberry frozen yogurt last weekend and it was amazing! Lee: Because cherries are fruits, their pectin content will vary by variety and ripeness. 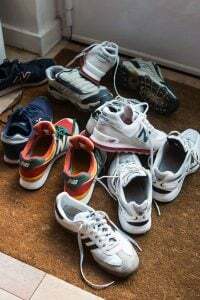 So that is likely the cause of your jam not jelling up the same way as the others. 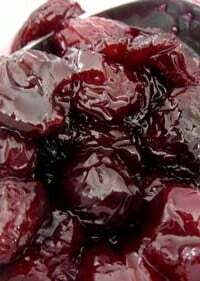 You could add a splash of apple juice when cooking the cherries, which has a lot of pectin in it. Anna: Yes, I would still add the lemon for the pectin. Ah, life in the southwest of France! Yesterday a van stopped at the gate selling lugs of fat red cherries. What I would do with all those cherries I didn’t know, but they were irresistible. I googled Cherry Jam and up popped my favorite food blog. David to the rescue! I put on my cheery red apron, found the pitter I’d bought at a brocante fair years ago, and there is now a row of ruby red jars cooling on the counter. I didn’t actually need one of those beautiful copper confiture pans, but don’t you think it would be nice to use? A couple of tips: one needn’t lick the utensils, a slice of baguette will do the job. 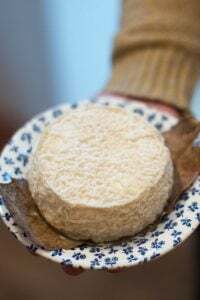 And remember your jar of jam for picnic fare, preferably overlooking a flock of sheep: a loaf of bread, some cherry jam, good cheese from the Pyrenees. It’s a shepherd tradition. I received two boxex of ripe Bing cherries this morning, the first thing that came to my mind was to turn them into jam. From the google search the most attractive one was the “no recipe jam”. I have just finished making it and it tastes divine even hot!! I am now making going to make small pastry tartlets and I know they will be poilished off in no time!! Thank you for the very easy recipe, I will be sure to look out for your cookbooks when I am in the US next. I will definitely pass this un-recipe on to mom! I had great success with this recipe — many thanks! Made one tweak to ramp up the pectin content that I wanted to pass along. I happened to have a case of blenheim apricots on hand, so I took 4 that were still unripe, cut them in half and added them to the jam as I was cooking it. (Unripe fruit, as many readers may know, has more pectin). Then I just removed the apricots before putting the jam in jars. This got me to the “wrinkle” stage after about 10 minutes of boiling. Since apricots and cherries are compatible, I wasn’t worried about adding a peculiar flavor to the jam. In fact, cherry jam is great with apricot kernels, which add a subtle amaretto note. To use, take the pits out of about 15 apricots, bake the pits at 350 for 15 minutes, crack open (I used a hammer) and remove the kernel. Slip the brown skin off the kernel, then bake again for @ 5 minutes more. Add to the cherries along with the other jam ingredients. I googled recipe cherry jam yesterday having picked about a kilo from a public tree (I was finally tired enough of treading them into the ground each year… ) and picked your one from the results. It is as all the others say, lovely; I am actually proud of ‘my’ jam! I have read the other comments and … this is the first I got about adding any water. I started on the minimum heat possible, stirring constantly to ensure all the fruit warms through evenly, which brings out the resident liquid (juice). Which perhaps lessens the boiling time? Also, I didn’t have a pitter and couldn’t get one. 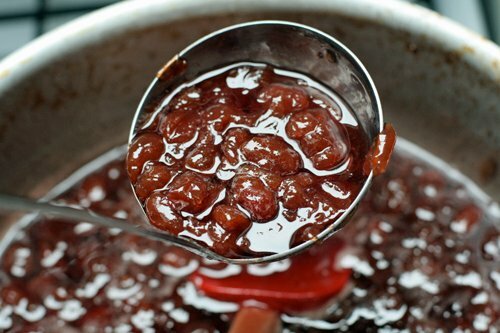 I warmed the whole cherries through first, as above, then squeezed each pit out into a sieve over the jam pot – dropping the cherry into the pot…. (this works even better if you can find a way of piercing the skin of each cherry first, I lost patience, but those were the easiest) In the time it takes to complete the batch, all the juice will dribble down and back into the pan. Give the sieve a quick shuggle at the end, and stroke the underside with your spatula/spoon to glean as much back as possible… then cook! The bit of heat before hand helps the pit come out free of the flesh. It is still a very wet job though! Do you have any other no-recipes David, esp in the [chocolate]cake arena? I find adapting cake recipes to include cocoa less successful, as the cocoa acts like a ‘mini-flour’ and dries the mixture; adding water affects the egg/flour ratio and it effects the spongyness… and so on. Any tips on this would be a boon_bien. I pulled an all-nighter making cherry jams last night. I’m in Slovenia right now and it’s just too hot to cook during the day…but they have the most amazing cherries, I couldn’t pass them up. Both the sweet and sour are so big that they barely fit in my cherry pitter! Am dying to make some gelato with this marvelous sour cherry jam…the sweet cherry are going with goat cheese for lunch today. Thank you! So easy and delicious! Thank you so much for yet another wonderful recipe. Or shall we say non recipe in this case. My sour cherry jam is beyond delicious, as you knew it would be. The lemon keeps it bright after all that sugar. I am so lucky to have access to a cherry tree that no one seems interested in. I think I know why after pitting all that fruit. So worth the work! Hi, just wondering why no pectin. Pectin is natural, do you think it affects the flavor? I got a huge amount of it from Pacific Pectin (their low sugar version) last month so that I can rest assured of set in all my preserves (I make lots). 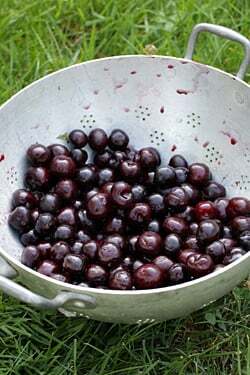 I just picked my Montmorency tree, am making 3 qts of sour cherry liqueur, and will use the rest to make some preserves, will try out your recipe. I made your cherry jam yesterday. Incredibly rich and dense flavor. Can’t wait to have it on toast in the winter. 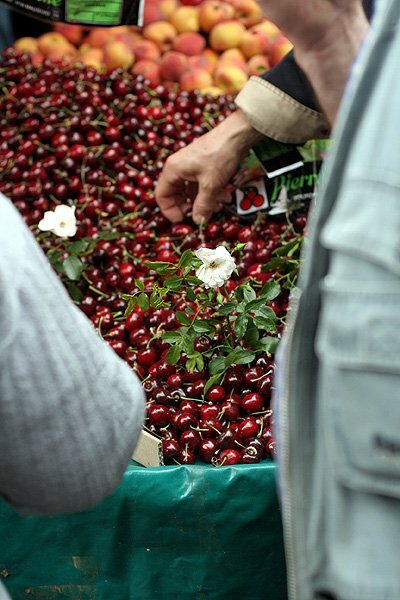 Will bring back memories of picking the cherries with friends. We discovered wild cherry trees in our local park recently and fell in love with the tiny sweet fruit. We subsequently took our two little boys on a cherry picking expedition and collected a whole carrier bag full of them! We then trawled the net looking for recipes and came across this one and, for the first time ever, we made jam! Delicious perfect jam and all for the cost of a bag of sugar. Amazing. We can’t wait to have it for breakfast in the morning… Thanks David! Would this work with Ranier Cherries? Not sweet enough? Anna: It should work with them, although I haven’t tried using them myself. Lisa: Pectin was discussed in previous comments and some readers had suggestions and concerns as well, which add to the conversation. I don’t use it, so can’t advise on quantities, but you are welcome to add it if that’s customary for you. I’ve made this jam twice now with the tiny little sour cherries that grow at my father-in-laws. I don’t know what variety they are but the jam turns out delicious every time. I love that the only labor intensive part of this recipe is the pitting. I do can mine for a longer shelf life, and it preserves very well. Everyone loves this jam! A friend gave me three pounds freshly picked from Creston, BC, and I’m making the jam now. In case you haven’t found this beauty, it made short work of pitting. By the way, I have tried a number of your ice cream recipes. Amazing. People at dinner parties think I’m a wizard. Hi David! I made sour cherry jam this summer using your non-recipe and it was amazing (also your lemon tart with Meyers nicked from a tree in a vacant parking lot – love the Bay Area!). I’m seeing beautiful green Kelsey plums pop up in the farmer’s market and I’m wondering – would plums work with this same general formula? I’d be making “refrigerator jam,” since I’m terrified of giving anyone botulism. Thanks so much for your wisdom & recipes! Could I apply this no-recipe jam – 1 cup fruit puree:3/4 cup of sugar – to other fruits e, peaches? I’ve seen this ratio being used for jams: 1lb uncooked fruit:1lb sugar. Could your ratio be converted to 1lb uncooked fruit:12 oz of sugar? Just started jamming and my goal is to use enough sugar to prevent the jam from spoiling, but not tons that the final result is overly sweet.